enkl.se was founded by Jens Beck-Friis in 2004. It is a market place for freelancers within design, development, production, as well as many other competences. The site has a desktop version as well as a mobile version. The mobile version was created as a WordPress child theme. In that way minor changes that was required for the mobile version could be implemented with ease. The Any Mobile Theme Switcher plugin was used to create the theme switch for mobile platforms. 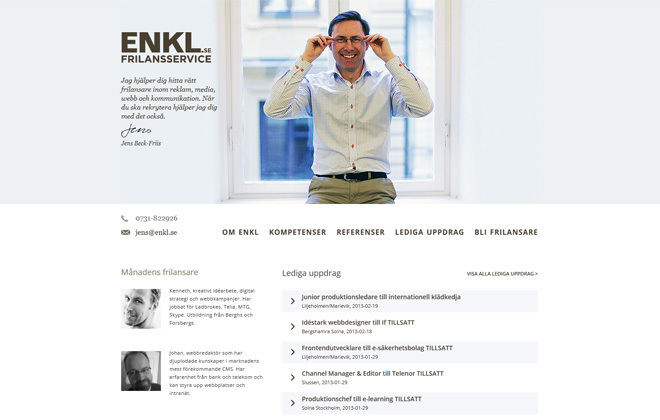 Have a look at the site at enkl.se.